The South Asian Association for Regional Cooperation Chambers of Commerce and Industry (SAARC CCI) and the International Centre for Integrated Mountain Development (ICIMOD) signed a memorandum of agreement to strengthen private sector engagement for sustainable mountain development in the South Asian Region. The memorandum of understanding was signed by Mr Muhammad Iqbal Tabish, secretary general of SAARC CCI and by Basanta Raj Shrestha, director of strategic cooperation at ICIMOD. 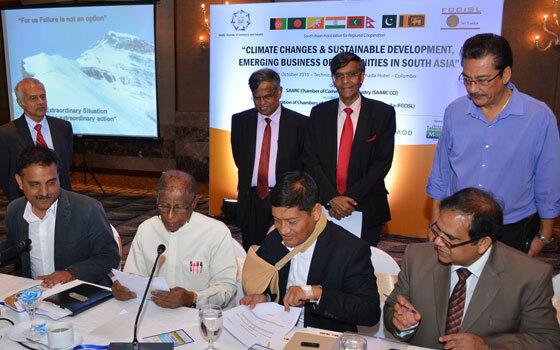 The signing of the strategic partnership was held during the regional conference “Climate Change and Sustainable Development: Emerging Business Opportunities in South Asia” in Colombo, Sri Lanka and organised by SAARC CCI. A leading body of businesses in South Asia, SAARC CCI considers ICIMOD as a strategic knowledge and technical partner for environment and climate change related topics. ICIMOD will share with SAARCH CCI information on climate change, conservation of the environment, water resources and energy for the region. Likewise, ICIMOD recognises SAARC CCI as an important stakeholder in achieving its objectives for sustainable mountain development within the region’s private sector. The SAARC CCI-ICIMOD partnership aims to enhance the understanding between corporate and development sectors that social and ecological impacts in business practice are key to sustainability and should be an integral element of corporate practice and policy. Areas of cooperation include: knowledge sharing, development of sustainable business solutions, strengthening linkages with national chambers of commerce and industry in the region, joint events, and policy dialogue on mutual topics of interest. SAARC CCI includes representatives of national Federations of Chambers of Commerce and Industry of the SAARC countries. It also provides input and feedback of the private sector on economic and trade related issues to SAARC Secretariat for policy formulations. The management of SAARC CCI attaches great importance to climate change and its possible socio-economic, environmental and biological implications on South Asian region.